1857. NARRATIVE. This was a very full year in many ways. In February, Charles Dickens obtained possession of Gad's Hill, and was able to turn workmen into it. In April he stayed, with his wife and sister-in-law, for a week or two at Wate's Hotel, Gravesend, to be at hand to superintend the beginning of his alterations of the house, and from thence we give a letter to Lord Carlisle. He removed his family, for a summer residence in the house, in June; and he finished "Little Dorrit" there early in the summer. One of his first visitors at Gad's Hill was the famous writer, Hans Christian Andersen. In January "The Frozen Deep" had been played at the Tavistock House theatre with such great success, that it was necessary to repeat it several times, and the theatre was finally demolished at the end of that month. 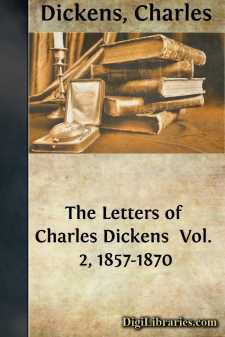 In June Charles Dickens heard, with great grief, of the death of his dear friend Douglas Jerrold; and as a testimony of admiration for his genius and affectionate regard for himself, it was decided to organise, under the management of Charles Dickens, a series of entertainments, "in memory of the late Douglas Jerrold," the fund produced by them (a considerable sum) to be presented to Mr. Jerrold's family. The amateur company, including many of Mr. Jerrold's colleagues on "Punch," gave subscription performances of "The Frozen Deep;" the Gallery of Illustration, in Regent Street, being engaged for the purpose. Charles Dickens gave two readings at St. Martin's Hall of "The Christmas Carol" (to such immense audiences and with such success, that the idea of giving public readings for his own benefit first occurred to him at this time). The professional actors, among them the famous veteran actor, Mr. T. P. Cooke, gave a performance of Mr. Jerrold's plays of "The Rent Day" and "Black-eyed Susan," in which Mr. T. P. Cooke sustained the character in which he had originally made such great success when the play was written. A lecture was given by Mr. Thackeray, and another by Mr. W. H. Russell. Finally, the Queen having expressed a desire to see the play, which had been much talked of during that season, there was another performance before her Majesty and the Prince Consort at the Gallery of Illustration in July, and at the end of that month Charles Dickens read his "Carol" in the Free Trade Hall, at Manchester. And to wind up the "Memorial Fund" entertainments, "The Frozen Deep" was played again at Manchester, also in the great Free Trade Hall, at the end of August. For the business of these entertainments he secured the assistance of Mr. Arthur Smith, of whom he writes to Mr. Forster, at this time: "I have got hold of Arthur Smith, as the best man of business I know, and go to work with him to-morrow morning." And when he began his own public readings, both in town and country, he felt himself most fortunate in having the co-operation of this invaluable man of business, and also of his zealous friendship and pleasant companionship.